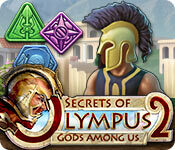 Secrets of Olympus 2: Gods among Us is rated 3.3 out of 5 by 26. Rated 5 out of 5 by ooakPlayer from One of my favorites! I really enjoy this game a lot and play it frequently. It is not difficult, but requires some strategy and understanding of how the special tokens work. For those who have found it to tough to get through, I hope my review can help. 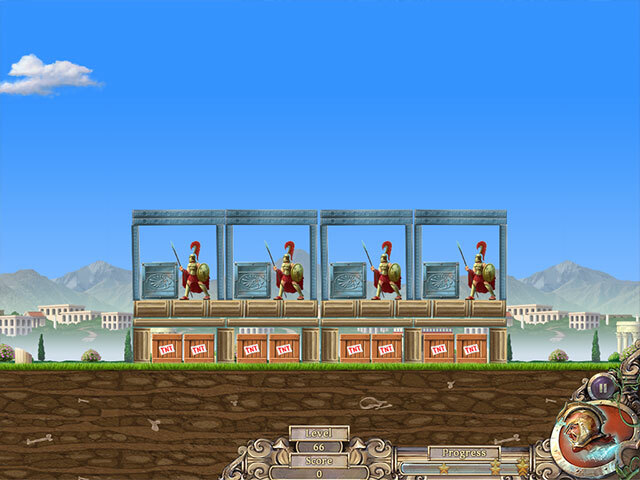 To start, I’d like to address the Levels that require projectiles to destroy the Roman soldiers [Levels 6, 12, 18, etc. ]: these levels are NOT mandatory and can easily be skipped. You do not even have to click on them to play through and get the “skip” message. It is very simple. 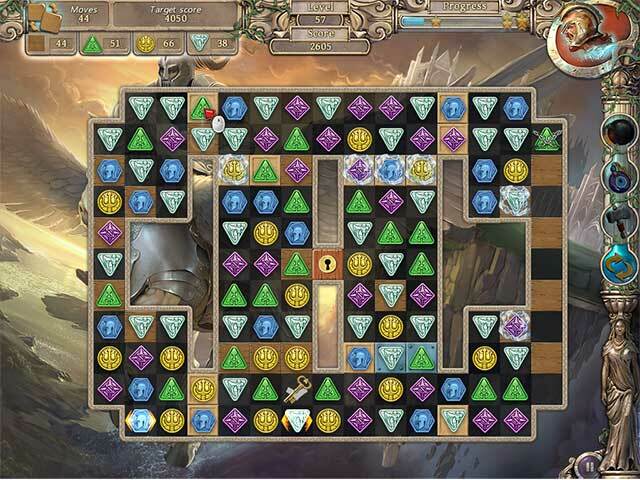 Once you have cleared Level 5, Level 7 becomes available to play so just move down to the next row and continue. Most Levels are “limited moves” but a few are timed. Timed was more difficult for me, but really, really fun trying to beat the stingy timer! I have read in the Game Forum for SoO2 that many people seemed to have difficulties with this game and some Levels in particular were mentioned multiple times [Level 56 , Level 110]. I am here to tell you that it will not require more than one or two tries to clear if you know how the special tokens work. First the “Fireball with Arrows” [I have to make these terms up as the game does not have names for them, and it’s true there is no tutorial, another common complaint]. You get this token when you match 5 same-color tokens. The token looks like a red fireball with arrows in it and when you get that token and swap it with an adjacent token, the fireball releases its arrows to destroy all [or most] of the tokens of the same color as the one you swapped it with. Yay! You can strategically use this token to release troublesome chained or iced tokens that are impeding your progress! The trouble is that the tokens rarely align themselves properly to get 5 in a row, especially on boards where there are a lot of little alcoves or no large open spaces. That is where you need to rely on your TOOLS over on the right-hand side of the board. The Swap Tool is the first available so using it to swap a couple of tiles to get the opportunity to swap for five-in-a-row (and the wonderful Fireball token!) is often the only way to release the troublesome chains or icicles. Fortunately, once you do that, so many tokens are destroyed that you almost always get your Swap Tool back, so keep looking for opportunities for using Swap Tool to create a five-in–a-row opportunity to get the precious Fireball! But the real secret is swapping the Fireball with another upgraded Token, like the ones you get when matching 4-in-a-row, which is much easier to get. See what happens when you swap a special “Glowing Token” and a Fireball! EXPLOSIONS start happening everywhere! Whoosh, whoosh! It destroys nearly half the board, your tools power back up and you get more opportunities to create Fireballs and sometimes it almost feels like cheating, lol. If you’re lucky enough to get 2 Fireballs next to one another and you swap a Fireball with a Fireball, all of their arrows shoot up in the air and come down randomly on the board multiple times!!! It just comes down to a little strategy, figuring out how to align the special tokens so they can work their magic. When I started the game and before I realized this, I thought it was really hard and worried that I wouldn’t be able to complete the higher and highest Levels. But by the time I was in the [last] Minotaur section, I was easily getting through each level at first try, I only had to do it over if I had a bad board where you have little or no swap opportunities to begin with. It happens. The hardest Levels for me were the timed Levels, in particular Level 118. But I have managed to get three stars on that level many times now, and I am slow so it is probably easier for you fasties, lol. But definitely a fun game and one of my favorites! I hope they come out with another version soon! Rated 5 out of 5 by SixSigma from Good Challenge One of the more challenging match 3 games I've played in a while. Recommend this game. Rated 5 out of 5 by lj71875 from Challenging Match 3 Finally a game I could not finish in a day. Rated 5 out of 5 by polym from Very addictive! Challenging game; once you work out how to use the slingshot; it is not already loaded, so you have to load it then; Ping. Will look at others in the series Very good for those who do not want a story line. Rated 5 out of 5 by mausmausmaus from Really great Match 3 Nice to play. I liked it and can recommend it. Rated 5 out of 5 by cookieman1 from GREAT STRATEGY/MATCH 3 GAME! This game is great! I love games that make you think. You have to accomplish your goals with a set number of moves. The only level that threw me off was level six, as some players mentioned. But once you figure out how to accomplish the goal (you're using a catapult to hurl boulders at structures you need to topple), you're good to go. I made it to level 24 within the 1 hour free play and immediately bought it. The visual and sound effects are good. This match 3 game will probably become one of my favorites. Worth the money to me. Rated 5 out of 5 by ChristineP1977 from c'mon, level 6 is so funnn I don't understand you people complaining about level 6. Its an Angry Birds type of game, I've played this with my daughter for hours.. much more interesting than those hidden objects, I'm so bored with them.. Rated 5 out of 5 by pennmom36 from It's Not A Secret Anymore, It's Fantastic! Some Match 3 games have no wow factor, but this game has all kinds of WOW factors. 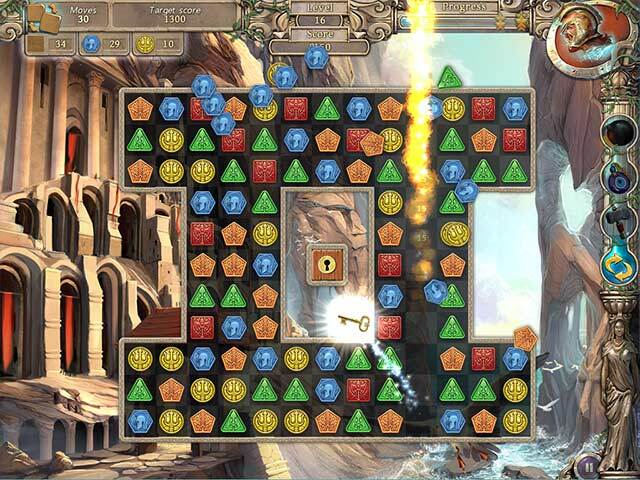 Each level gives you a different task such as clearing all background cells within a specific amount of moves, achieving a specific amount of points before the time runs out, or dropping a key to the bottom of the board so the key can unlock the rest of the board. If you make matches larger than 3, a bonus tile of that match will appear on the board and when matched will wipe out an entire column or row. Really large matches give you a fireball of exploding arrows which explodes all over the board. Certain matches fill up a bonus meter that can be used as well once filled up. My favorite feature is the columns that go from the top to the bottom and can only be destroyed by making matches beside the column. All leftover moves will explode fireworks that remove more tiles and gives you more points toward earning 3 gold stars per level, enjoy!